Tennis is played on various indoor and outdoor surfaces; playing strategies are adapted to the court surface. 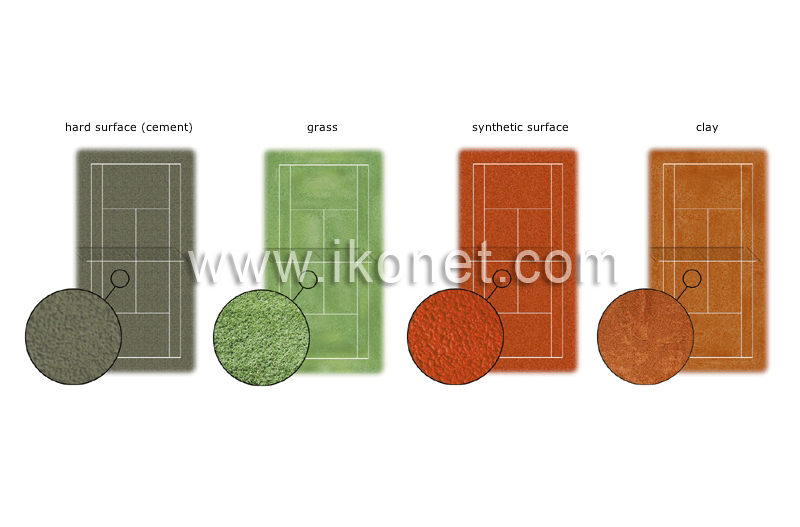 Extremely fast playing surface that favors a serve-and-volley game; grass surfaces are increasingly rare due to high maintenance costs. Soft elastic surface that offers excellent bounce and reduces the risk of injury. Surface given to fast bounces; hard surfaces quickly wear out shoes and balls. Slow and comfortable surface given to long rallies; clay courts require regular but low-cost maintenance.